Michele B. from Danbury, CT, has won the $1,000 gift card in the DealNews March Sweepstakes! What did Michele say, upon hearing? "So grateful! Going out to buy some stuff I need and some stuff I don't! Thank you!" Congrats on winning, Michele! 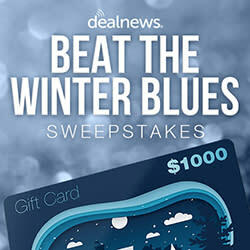 Chris A. Florham Park, NJ, has won the $1,000 gift card in the DealNews February Sweepstakes! What did Chris say, upon hearing? "I look at the DealNews site pretty much every day. There are a ton of 'bargain sites' on the internet, but there is only so much time one has to peruse them. So, I go back to DealNews only based on the layout, research done by the staff and the ability to search for recent items. Many thanks from someone who rarely enters and wins things!" Congrats on winning, Chris! Our Black Friday 2018 Sweepstakes Winner! Lloyd T. from Gasquet, CA, has won the $1,000 gift card in the DealNews Black Friday 2018 Sweepstakes! Congrats on winning, Lloyd! We hope you can put that money to good use. Our Nintendo Switch Sweepstakes Winner! Matthew P. from Olympia, WA, has won the Nintendo Switch in our DealNews Nintendo Switch Sweepstakes! What did Matthew say, upon hearing? "DealNews is the first deal website I joined/make regular use of, and still one of the best!" Congrats on winning! Our December Anniversary Sweepstakes Winner! Barbara V. from Richmond, VA, has won the $2,000 gift card in our DealNews Anniversary Sweepstakes! What did Barbara say, upon hearing? "OMG - I am in shock!! I never win anything. I do love DealNews and have been a fan for a long time. I have gotten some great deals over the past couple of years - woohoo!!" Congrats on winning! Our November Anniversary Sweepstakes Winner! Dennis V. from Panama City Beach, FL, has won the $2,000 gift card in our DealNews Anniversary Sweepstakes! What did Dennis say, upon hearing? "I am sincerely thankful and humbled for being selected the winner of the DealNews Anniversary Sweepstakes for November. I value the services of DealNews throughout the year and especially during the holiday season. Best wishes always!" Congrats on winning! Our September Anniversary Sweepstakes Winner! Sam M. from Billings, MT, has won the $2,000 gift card in our DealNews Anniversary Sweepstakes! What did Sam say, upon hearing? "Thanks DealNews, I can't believe I won! This just makes it even more worthwhile to regularly check your app!" Congrats on winning! Our October Anniversary Sweepstakes Winner! Gregory W. from Fayetteville, WV, has won the $2,000 gift card in our DealNews Anniversary Sweepstakes! What did Gregory say, upon hearing? "Thank you! Thank you! This is the biggest prize that I have ever won in my life!!" Congrats on winning! Our August Anniversary Sweepstakes Winner! Cheryl B. from Camillus, NY, has won the $2,000 gift card in our DealNews Anniversary Sweepstakes! What did Cheryl say, upon hearing? "Believe in endless possibilities! I just celebrated my August birthday. What a gift!! Thank you, DealNews!!" Happy birthday, Cheryl! Congrats on winning! Marcia O. from Richland, WA, has won a Tenergy Syma X20 Drone in our DealNews Drone Survey Drawing! What did Marcia say, upon hearing? "Thank you for choosing me. I rarely win anything, so this is a huge surprise. My husband just recently decided that he wanted a drone, so you've fulfilled his wish. Let the games begin!" Congrats on winning! Our July Anniversary Sweepstakes Winner! James M. from Newport, TN, has won the $2,000 gift card in our DealNews Anniversary Sweepstakes! What did James say, upon hearing? "Thanks, Dealnews! This prize will come in very handy for me right now! I appreciate it!" Congrats on winning! Thomas P. from San Jacinto, CA, has won a Tenergy Syma X20 Drone in our DealNews Drone Survey Drawing! What did Tom say, upon hearing? "Woohoo! I never win anything. The Tenergy Syma X20 Drone will definitely ease me into the world of drones. Thank you so much!" Congrats on winning! Our June Anniversary Sweepstakes Winner! Mike J. from Silver Spring, MD, has won the $2,000 gift card in our DealNews Anniversary Sweepstakes! What did Mike say, upon hearing? "Wow, what an amazing email to receive, I mean, just wow! I can't express my gratitude enough, not just for this awesome prize but for your site in general. I'm receiving this news on my mother's birthday and, not coincidentally, at the first gathering of our family since both my sister had a kid, and my wife and I had our own. Talk about the icing on the cake! Thank you so much!!!" Hope your family enjoyed the celebration! Congrats on winning! Our May Anniversary Sweepstakes Winner! Tom S. from Red Lion, PA, has won the $2,000 gift card in our DealNews Anniversary Sweepstakes! What did Tom say, upon hearing? "I feel good, I knew that I would. Thank you DealNews." So good! Congrats on winning! Our April Anniversary Sweepstakes Winner! Hanru R. from New York City, NY, has won the $2,000 American Express Gift Card in our DealNews Anniversary Sweepstakes for April! What did Hanru say, upon hearing? "This is amazing! Didn't expect this at all, always make use of the app and site and this just being a bigger bonus- really grateful - thank you so much!!!" Congrats on winning! Debbie L. from Charleston, WV, has won a $500 Walmart gift card (provided by Walmart), Asus Flip Rockchip Quad 1.8GHz 10.1" 2-in-1 Touchscreen Chromebook, and The North Face Unisex Borealis Backpack in our DealNews Back to School Sweepstakes! What did Debbie say, upon hearing? "I'm so excited to finally win something!" We are excited for you too! Congrats on winning! Lilia F. from Jersey Village, TX, has won the Apple iPad Pro 9.7" 32GB WiFi Tablet from our DealNews iPad Pro 9.7" Sweepstakes! What did Lilia say, upon hearing? "This is awesome and THANKS SO MUCH FOR ROCKING WITH THE BEST DEALS EVER!!!" Congrats on winning! Jason B. from Augusta, ME, has won the $100 American Express gift card from our DealNews Black Friday Survey Sweepstakes! What did Jason say, upon hearing? "Dealnews.com is the web site I recommend more than any other website. I love it, and everyone associated with it. Over the time I've been visiting, you all have saved me a lot more than this $100… but I'll take the $100 as a bonus." Congrats on winning! Jay K. from San Antonio, TX, has won one of four Amazon Fire Bundles, which includes an Amazon Fire 8GB 7" WiFi Tablet with Special Offers and a $50 Amazon gift card, in our DealNews Summer Reading Sweepstakes! What did Jay say, upon hearing? "Oh my gosh. The only time I ever won anything on the Internet. This is great. Thanks DealNews, you're the greatest!" No you are the greatest! Congrats on winning! William T. from Little Rock, AR, has won one of four Amazon Fire Bundles, which includes an Amazon Fire 8GB 7" WiFi Tablet with Special Offers and a $50 Amazon gift card, in our DealNews Summer Reading Sweepstakes! What did William say, upon hearing? "I love the DealNews.com site. I've entered a lot of the sweepstakes on the site, and I'm really glad to have finally won something. Thanks!" Congrats on winning! Maureen S. from Tampa, FL, has won one of four Amazon Fire Bundles, which includes an Amazon Fire 8GB 7" WiFi Tablet with Special Offers and a $50 Amazon gift card, in our DealNews Summer Reading Sweepstakes! What did Maureen say, upon hearing? "Woo hoo! Thanks so much! I never win anything! I can't thank you enough. We love DealNews, checking deals every morning. Again, thank you very much." Congrats on winning! Weili W. from Katy, TX, has won one of four Amazon Fire Bundles, which includes an Amazon Fire 8GB 7" WiFi Tablet with Special Offers and a $50 Amazon gift card, in our DealNews Summer Reading Sweepstakes! What did Weili say, upon hearing? "Thanks Dealnews! I never thought I would actually win anything!" Dreams do come true! Congrats on winning! Richard A. from Somerset, NJ, has won a $100 Amazon Gift Card in our DealNews Back-To-School Survey Sweepstakes! What did Richard say, upon hearing? "I've been going to DealNews daily for at least 5 years now. I can't even count the number of deals I've taken advantage of. But I've always wondered who won these sweepstakes prizes. Now I know. Thanks DealNews!" Congrats on winning! DeAndré W. from Philadelphia, PA, has won an Apple Watch 38mm Sport Smartwatch in our DealNews Father's Day Apple Watch Sweepstakes! What did DeAndré say, upon hearing? "Thanks a ton! This may be the first time I've won anything, and just in time for Father's Day at that. DealNews is great!" We hope you enjoy spending time with your new watch! Thanks for being a fan and congrats on winning! Curtis N. from Marlborough, MA, has won an Apple iPad Pro 9.7" 32GB WiFi Tablet in our DealNews All New (All-Smaller) iPad Pro Sweepstakes! What did Curtis say, upon hearing? "Thanks for [the] prize! As a longtime DealNews subscriber I always recommended DealNews to friends and family for savvy and useful reviews." Thanks for being a fan and congrats on winning! Jim B. from Saint Cloud, MN, has won a Movado Women's Movado LX Watch, courtesy of Ashford, in our DealNews Mother's Day Sweeps! What did Jim say, upon hearing? "Unbelievable. What a wonderful Mother's Day present. Thanks DealNews. I have been using your site forever. You are my go-to website. I check in numerous times every day. Again, thanks so much!" You're very welcome! Congrats, on winning! 1-Week iPad mini 4 Sweepstakes Winner! Kenneth D. from Gillette, WY, has won an Apple iPad mini 4 8" 16GB WiFi Tablet in our DealNews 1-Week iPad mini 4 Sweepstakes! What did Kenneth say, upon hearing? "I am deeply appreciative of DealNews and would urge all to use this resource for all purchases. Thank you very much!" Congrats, on winning! Lenovo Tablet Bundle Sweepstakes Winner! Darcy R. from Los Angeles, CA, has won a Lenovo Tab 2 A8 16GB 8" Android Tablet, Lenovo Folio Case, and Lenovo Power Bank courtesy of Lenovo, in our DealNews Lenovo TAB 2 A8 Tablet Bundle Sweepstakes! What did Darcy say, upon hearing? "Never thought it would happen. Thanks DealNews!!!" Congrats, on winning!!! HP Convertible PC Sweepstakes Winner! Ruth C. from New York, NY, has won a HP Spectre x360 Intel Skylake Core i7 2.5GHz 13.3" 1080p Touchscreen 2-in-1 Laptop, courtesy of HP, in our DealNews HP Convertible PC Sweepstakes! What did Ruth say, upon hearing? "Thank you DealNews. Thank you. Thank you. I'm so proud I won. You guys have the best listings around. I've used your website since the beginning and I will continue to do so. Thanks again." Congrats, on winning! Bruce J. from Dallas, GA, has won a bundle of prizes, courtesy of Walmart, including an Apple iPad Air 2 16GB WiFi Tablet, Apple TV, and a $100 iTunes Gift Card in our DealNews 19th APPLEversary Sweeps Winner! What did Bruce say, upon hearing? "WOW... what a great way to start my week!!! Many thanks! 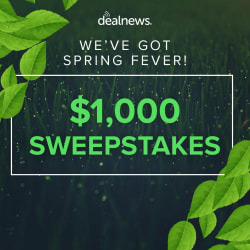 I've been a DealNews subscriber a long time and have saved lots of money from using the website... and never in a hundred years would I think I'd be a winner! I can't say thank you enough... WOW!!!" Congrats, on winning!